Although high-performing teams have many things in common, there is one clear question that can determine whether you are on a high-performance or low-performance team: At work, do you have the opportunity to use your strengths every day? It’s truly amazing how simple it is. If you feel that you are using your strengths more often – contributing your unique talent out into the world – you will be more profitable, more productive, more likely to stay at your company, less likely to have accidents on the job, and have many, many more positive outcomes. If you are an employee, you already know that your happiness depends upon whether or not you can use your strengths at work. But if you are a manager, the difference between a low-performing team and a high-performing one comes from you knowing the strengths of your employees, and asking them to contribute those strengths every day. 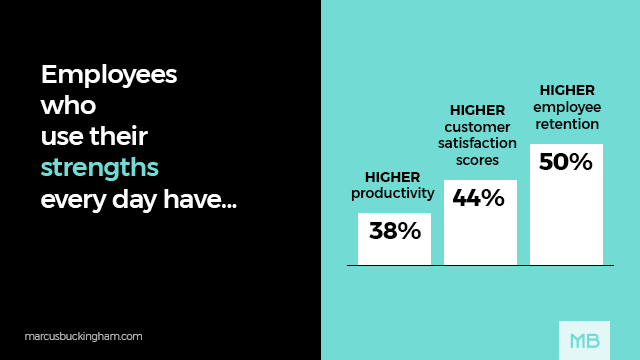 It’s the single most important driver of team performance – and yet, less than 2 out of 10 employees strongly agree that they get to use their strengths at work every day. Can you imagine if 80% of your company suddenly felt this way? What could your people, your teams, and your company do, armed with a workforce that knows their strengths and contributes them daily? Are you one of the 2 out 10? At work, do you have the opportunity to use your strengths every day?